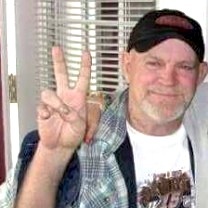 Raymond “Bo” Whitney, 68, of Olathe, Kansas passed away Sunday, May 15, 2016. A Celebration of Life will be held at 11:00 AM, Saturday, May 28, 2016 at 705 N. Pine St., Olathe, Kansas 66061. Bo was born February 1, 1948 in Kansas City, Kansas to Harold and Solange Whitney, who precede him in death. Also preceding him in death is his brother, Robert Whitney. Bo is survived by his sister, Barbara Doles, of the home; his children, Rhonda Aleson, of North Dakota, and Amy Whitney and Jamie Whitney, both of Canada; several grandchildren, several nieces and nephews; and his good friend, Tommy Doles. Bo was an over-the-road truck driver, who was extremely good at what he did for a living. He was also a lover of John Wayne and old western movies. He excelled in music, listening and playing music on his guitar and keyboard. He enjoyed spending time with his family, whom he adored. Bo was a hero to all who knew him, especially his loving family. In lieu of flowers, the family asks that you bring a dish to share for the pot-luck lunch celebration of Bo’s life.